Body hair. It's a personal preference. Some gals rly own the natural look, some gals are a bit 50/50 [ie, "I'll shave the parts you can see, but the rest can gtf"] & some gals are forever fuzz free. I'm in the 50/50 category tbh. I personally cba with shaving my legs every single day [and as there is a distinct lack of action / leg stroking in my life, I don't have the motivation to even bother anymore] - but I'd love to have permo smooth skin; without any of the effort or drawbacks of shaving. That's why I'm so into the idea of laser hair removal; something which I'm gonna explain my love for throughout this post. Thanks for coming to my hairy TED Talk. Though grabbing a razor is the simplest and quickest way to de-fuzz, it's not the most long lasting of solutions. I think science says that the hair starts regrowing within the space of about 8 hours?? So if you shave ya pins in the morning before work but end up staying out on a hot date with that lad from the office you pure fancy [true story] and he reaches for a lil calf stroke [ooh, steady on!] you might feel a bit wary of that delightful prickly sensation. I'm a big fan of epilating or waxing; but my issue with these two methods is the messiness [waxin'ell], pain, noise [of the epilator whirring away and me screaming as I ferociously rip a hot wax strip off] and how they can leave your skin sorta red raw & tender for a few days afterwards. Can't win here, hun. - And that having lasered honestly cuts down on getting ready time so bloody much. If the idea of laser hair removal appeals to you after reading this, Pulse Light Clinic in London are a fantastic venue to check out. These guys offer so many services that I'm totes interested in; including fat freezing, acne scar removal [pls!] and anything / everything to do with lasering off me fuzz. 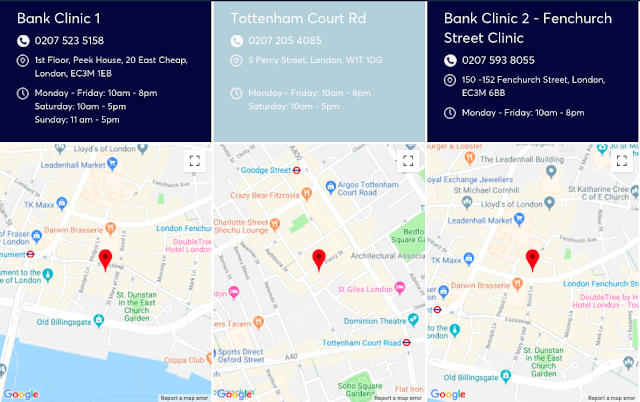 Here's a quick lil video explainer of the laser hair removal process, and a couple of maps showing where you can locate Pulse Light's London based clinics. Have you ever tried laser hair removal before? Would you? What are your feelings towards body hair?